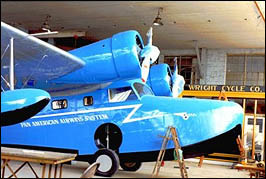 In 1936 Grumman was approached by several wealthy Long Islanders who wanted an aircraft for their personal transportation. 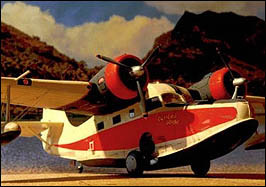 They needed an aircraft large enough to carry their families and baggage on trips, luxurious enough to fit their business needs and with the ability to operate from land or sea. These men intended to leave from the water that bordered their Long Island mansions and fly as commuters to a seaplane base located at the foot of Wall Street. The aircraft's original $60,000 purchase price discouraged all but the wealthiest buyers, however it was an immediate success. The Goose was a true forerunner of today's executive business jets. Although this was designed as a civil aircraft, the military was the major customer with the Navy buying over 200 during World War Two. A total of 345 were built between 1937 and 1945. The Goose was a very successful and enduring airplane and a large number are still flying all over the world.